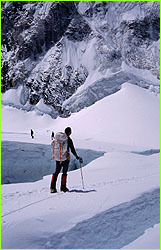 Often called the "Valley of Silence," the Western Cwm is a broad, flat, gently undulating glacial valley basin terminating at the foot of the Lhotse Face. The central section is cut by massive lateral crevasses which bar entrance into the upper Western Cwm. In this section, climbers must cross to the far right, over to the base of Nuptse to a narrow passageway known as the Nuptse corner. From here, climbers have a stupendous view of the upper 8,000 feet of Everest—the first glimpse of Everest's upper slopes since arriving at Base Camp. The last 5,000 feet on Everest, including its distinct black pyramid summit, are not visible from Base Camp. Contrary to what most people believe, some of the most difficult days on Everest are in the Western Cwm, when on a windless day it is desperately hot. Says David Breashears, "You literally pray for a puff of wind or a cloud to cover the sun so you can keep moving up to Advance Base Camp."